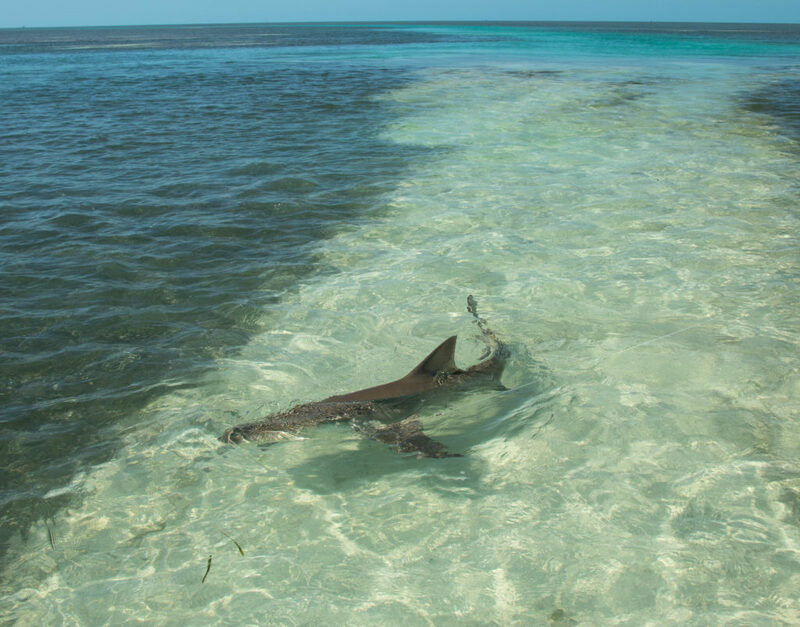 Shark fishing in the shallow waters off of the Florida Keys is an experience you will not soon forget. Our crystal clear waters and scenic backcountry are home to a variety of different shark species. Lemon, bull, blacktip, and nurse sharks are some of the more prevalent species swimming around in our shallow waters. Shark fishing is a year round fishery for us here in Key West, and for you anglers looking to pull in something big, this is right up your alley. We have a lot of fun with our shark fishing charters and these trips offer great opportunities for you get up close and personal with these awesome fish. Our shark fishing program is strictly catch and release and as much as people fear them, sharks are a very important part of the ecosystem. The first portion of our shark fishing charters are spent catching fresh bait. This is always a blast and a chance for everyone to warm up their arms for the big ones! Jacks, ladyfish, and mackeral are some of my favorites. They are very bloody/oily and get the job done. Typically we catch our sharks on pieces of cut bait on the bottom or live baits on the surface. Presentation will depend on the species of shark we are targeting as well as the general area where we are shark fishing. In certain situations these sharks can be caught using a properly presented lure or fly. Whenever possible we try and chum these beasts to us in shallow water where we can watch everything happen in front of us. Attracting sharks to the boat over a crystal clear sandbar or shallow flat (1-4ft deep) offers us a jaw dropping opportunity to watch them come in and eat the bait at our feet! Sometimes we incorporate shark fishing into our backcountry fishing charters, but if your main focus is to reel in one of these toothy critters I would dedicate your trip to it. Our sharks in the backcountry can range anywhere from 2-10+ feet in length and over 400lbs. You never know what you are going to get into. Shark fishing is year round here in Key West and we have a lot of fun with it. Take a look below at some of the more common sharks we find in the Florida Keys. Fly fishing for sharks on the flats off of Key West and the Florida Keys is becoming a popular target some some anglers. They are a big aggressive fish in shallow water that do a good job of reacting to a properly placed fly. Generally we are targeting lemon sharks and black tip sharks but you never know what’s going to swim your way out there. With huge drag screaming runs and cool eats off the surface I can see why people are enjoying such a cool fishery! We have a solid population of sharks all year round in the Florida Keys and Key West. Here is a quick list of some of the more popular sharks that you will find on a backcountry fishing charter. 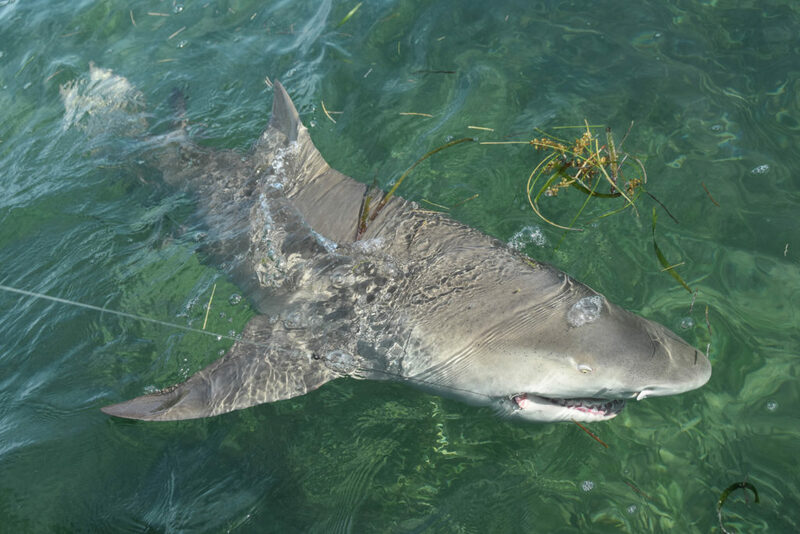 Lemon Shark – the most common shark found in the shallows off of Key West and the Florida Keys. Averages 4-7 feet long. Bull Shark – the biggest and meanest shark swimming around the near shore and backcountry area of the Keys. Averaging 6-9 feet long. Blacktip Shark – hardest fighting for their size, these sharks go on blistering runs when hooked and sometimes jump out of the water. Averaging 2-5 feet long. Bonnethead Shark – smallest shark we target while sight fishing with light tackle on the flats and shallows in the Florida Keys and Key West. Averaging 2-3 feet long. Nurse Shark – another popular species found while shark fishing, these fish are commonly found almost everywhere in the Florida Keys. Averaging 3-6 feet long. Atlantic Sharpnose Shark – on the smaller side but a good fighter and always welcome at the end of the line. Averaging 2-4 feet long. For a more detailed description of our commonly found sharks and information on the types of fish we have here in the Florida Keys, be sure to check out our fish species page.